What is the #1change you want to see happen in your lifetime? It is easy to get overwhelmed with the bad news that flood our newsfeeds and outlets every day – but fact is, that we are many: Many people, initiatives, organizations and social enterprises that work towards positive changes. Every day. If you zoom out for a second and imagine the planet from space and each person, initiative, organization that is working towards change as a tiny light on the planet, the continents would be lit up by us. We have noticed a tendency in many people who want to start building their career around creating positive impact: They censor their dreams and say things like ‘I know I can’t do xy but I want to create small change in z…’ – As if they were scared to be scolded as unrealistic or perhaps, scared to fail a bigger vision of change, not sure if they can make it happen and disappoint. So we started asking people what is the one change they want to see happen in their lifetime and start sharing the various initiatives and organizations that are addressing exactly that change in their city, region, world to connect dots, show what is possible and encourage people to dare to think big and start small. Because there is no power in reducing ourselves to the conditions we want to change. 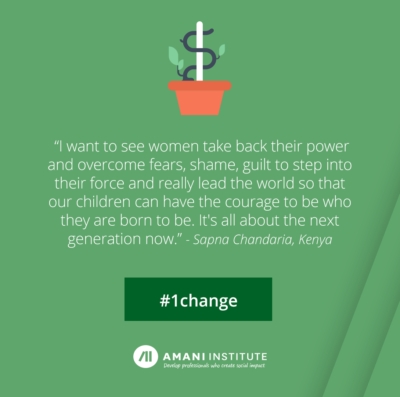 Stories of challenges around creating change and how they were overcome serve as a way to shed light on the many different possible paths one can take when deciding to become a changemaker. And that giving up is not an option. Stories of successes in creating change are equally important and we hope to feature your work going forward as well! Please drop us a message on Facebook with your work, where you do it in the world and we are happy to share it with the network and help with connecting the dots.